Mega Moolah is undisputed the most famous online Slot that Microgaming has done. It is perhaps the most played progressive jackpot of all time and amongst the best paying jackpots available online. 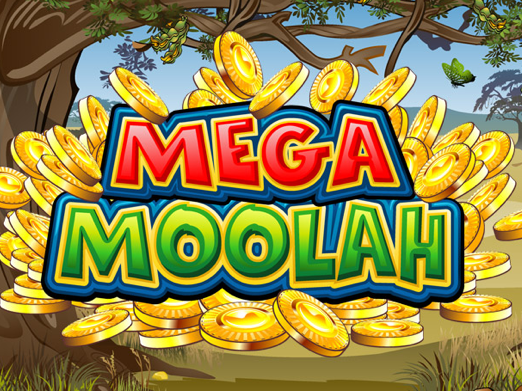 Mega Moolah adopts an African Safari theme with cartoon characters making up majority of the game symbols. The game is set under the amazing backdrop of the vast African savannah. The funky and lively design of this slot is perhaps what attracts players to the game, and if this is not the primary attraction, then the massive payouts are. Mega Moolah slot is a five-reel and 25 pay line slot with coin values as low as $0.01-$0.05. The total number of permitted coins are five a line - making the minimum wager a mere $0.01/line and spin. The maximum is fixed on the lower end too; $6.25. The slot machine has six major themed symbols; elephant, giraffe, wildebeest, zebra and gazelle. It also has the five conventional upper deck card symbols; 10, Jack, Queen, King and Ace. The Ace is the most rewarding of the card deck symbols with a total reward of 150 coins for five-of-a-kind. The King Lion icon is the most profitable of the themed symbols with a total payout of 15,000 coins for five-of-a-kind. The scatter symbol in Mega Moolah is a purple critter and rewards very generously. Bagging two of the princess looking critter rewards 2x multiplier while 3, 4 or 5 Critters rewards 3x, 20x and 100x respectively. When you land three or more critter symbols, you activate the free spin round. You are first awarded 15 free spins with specific multipliers. During this round, the free spins can be re-triggered indefinitely if you accumulate three or more Critter symbols. All the wins will be added to the winnings chart once the feature is concluded. The King Lion symbol plays wild. It doubles your winnings when substituted with any other symbol except the scatter symbol. If you manage to land five King Lion symbols on any part of the reels, you are rewarded with 15,000 coins! Mega Moolah has a whopping four progressive jackpots! To make the newseven better, the progressive jackpots in Mega Moolah are triggered randomly. However, the higher your bet, the higher your chances of hitting the progressive jackpot. The progressive jackpot round begins with a mystery wheel. The wheel is divided into four tiers each representing one of the four jackpots. Some jackpots have a higher chance of being won than others. The four jackpots are Mini, Minor, Major and Mega with prize money being not less than $10, $100, $10,000 and $1,000,000 respectively. The Mega Moolah progressive jackpot once made a record payout of 5.5 Million AUD to one lucky player. For Mega Moolah players who are not lucky enough to trigger the progressive jackpot, they can still enjoy the fixed jackpot which pays up to 75,000 coins! This is also a decent amount when you cash the coins into real money.